They spanned all ages. They were Indigenous and non-Indigenous, and came from all walks of life. 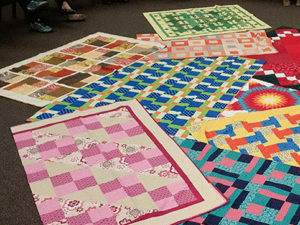 Some had participated in the KAIROS Blanket Exercise many times. For many more, it was their first time. 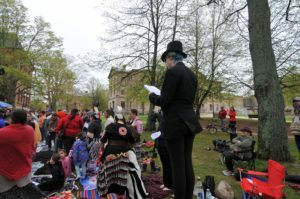 More than 1,000 people participated in eight Mass KAIROS Blanket Exercises and one reconciliation event in capital cities from St. Johns to Victoria starting May 28 in Charlottetown and ending June 5 in Whitehorse, marking the one year anniversary of the Truth and Reconciliation (TRC)’s release of its 94 Calls to Action. Victoria held a reconciliation event called 94 Calls for Justice where all 94 TRC Calls were creatively read out on the steps of the BC legislative Assembly. KAIROS partnered with several organizations to help make these mass events possible, including the Assembly of Seven Generations (Ottawa), Native Council of PEI (Charlottetown), Canadian Roots Exchange (Toronto), and RISE (Edmonton). 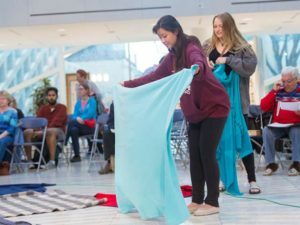 Youth presence was also felt in other events, particularly Ottawa and Toronto where KAIROS partnered with the Assembly of Seven Generation and Canadian Roots Exchange, respectively. Theland Kicknosway, who is 13 years old, led the round dance that concluded the Ottawa event. Another highlight in Ottawa was Frazer Whiteduck’s presence and speech. Whiteduck, who is with the Assembly of Seven Generations, planted the seed for the Mass Blanket Exercise on Parliament Hill last year to mark the end of the TRC but could not attend then. He was honoured to be at the Ottawa event this year, and to see his vision spread across the country. 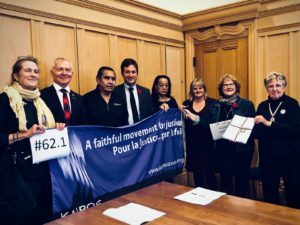 A week later, Neufeldt and other KAIROS members visited the Ontario legislature when 10,000 signatures of the Education for Reconciliation petitions were presented and the petition was read out. The petition will be read at least a few more times in the Ontario legislature as people meet with their MPPs to press for the full implementation of TRC Call 62.i. Stephen Kakfwi and Canadians for a New Partnership will also re-engage with the campaign in the fall, as KAIROS members in other provinces start their meetings with their provincial representatives. Pictures say a thousand words. Here are photos of the events across the country.